"Finally have service and will try to tweet the photos I am able to as I know many of you are desperate to know what's left," she wrote. "Survivors gave me numbers to call and I have. Powerful phone calls telling their loved ones they are alive." "Fire stations were destroyed, police stations were destroyed," Bowen said. "Public safety agencies are only taking highest priority calls right now ... heart attacks, you know, major trauma. ... An enormous amount of 911 calls are going unresponded to because we've got this priority to search and rescue. So it's a terrible thing." Tangie Horton, who lives inland from Mexico Beach, tearfully detailed the devastation in a Facebook video, saying, "I don't know if I can get through this or not but we're okay." 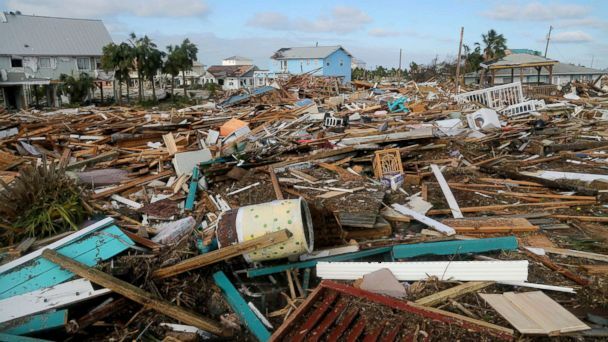 "This is where we were at when it hit ... can you imagine the people that was in Mexico Beach? We can't find four of our friends but they're still looking," she said. "It's just so sad ... it's just devastating."